Some of Gandhi's Early Views on Africans Were Racist. on Human/Civil Rights : Some of Gandhi's Early Views on Africans Were Racist. It is important to remember that the early Gandhi had little contact with Africans and did not understand their sensitivities. The recent agitation at the University of Legon in Ghana for the removal of a statue of Mahatma Gandhi was provoked by a few statements made by the young Gandhi soon after he arrived in South Africa in 1893, long before he came to know the Africans. These statements, plucked from the Collected Works of Mahatma Gandhi – published by the Indian government without any attempts at contextualising or annotating them – completely distort what his life represents. Gandhi said, “My life is my message”. His life shows how an ordinary human being who has many weaknesses can rise to great heights by shedding his early prejudices and by adhering to love and non-violence instead of hate and greed. This message should be an encouragement for the youth. Gandhi practiced what he preached. He conquered fear and defied the racist regime in South Africa and in imperialist Britain. He went to prison five times in South Africa and nine times in India during his struggle against racism and colonialism. He was incorruptible and forsook consumerism, which had become a menace to progress. He espoused dignity of labour and the need to protect the environment. He became a symbol of peace and non-violence and his appeal is universal. In 1893, the 23-year-old Gandhi arrived in Durban. He was enrolled as a barrister at the Inner Temple in London, but failed in his profession in India. He only excelled at drafting petitions and memoranda. A merchant in Durban offered him a one-year job to assist his lawyer in a litigation. This consisted mainly of translating accounts written in Gujarati to English. Even though the salary was a mere 100 pounds a year, Gandhi accepted the offer in the hope of finding better opportunities in South Africa. 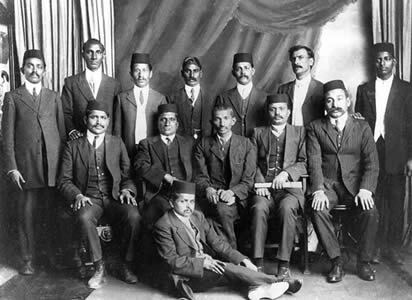 After the year was over, Gandhi managed to get an assignment from the merchants in Durban to advise and assist them on dealing with the actions of the Natal government and the local authorities against them. They offered 300 pounds a year in retainers. The immediate issue was the proposal to remove the voting rights of the few rich Indians who had them. Mandela was well aware of the racist statements made by Gandhi when he was young. He wrote in an article in 1995, "Gandhi must be forgiven those prejudices and judged in the context of the time and circumstances. We are looking here at the young Gandhi, still to become Mahatma, when he was without any human prejudice save that in favour of truth and justice." The term kaffir was not considered offensive at that time in South Africa as it became in later years. It was widely used, for example ‘Kaffir express’ for the train and ‘kaffir corn’ for the grain. The educated Christian Africans, who were known as ‘kholwa’, sometimes called the illiterate Africans kaffirs. Yet, it is surprising that Gandhi used that term. He must have known how the term kaffir – meaning infidel – was a derogatory term used by Muslims against Hindus in India. Gandhi had little contact with Africans then and did not understand their sensitivities. From today’s perspective, some of his statements in the first two years of his employment are unpardonable and very un-Gandhian. In opposing the system of import of indentured labour from India, Gandhi pointed out that it was detrimental to the interests of the Africans. India prohibited export of labour to Natal in 1911. During his stay in Natal from 1893 to 1901, Gandhi considered himself a temporary settler. He left for India in October 1901, but returned after the end of the Anglo-Boer War a year later at the request of the Indian community to lead deputations to the British secretary of state for colonies in Natal and the Transvaal. 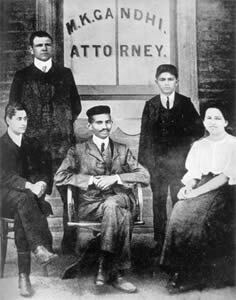 Gandhi settled in Transvaal as an attorney and developed a flourishing practice, earning as much as 5,000 pounds a year. He founded the weekly Indian Opinion in 1903. In 1904, he set up an ashram in Phoenix in Durban, in the midst of Africans and close to the industrial school of John Langalibalele Dube – the first president of the African National Congress. Dube’s weekly called Ilanga lase Natalwas initially printed in the press of Indian Opinion and the people from his school often visited the ashram. But his real concern was serving the Indian community in South Africa. He felt that Indians would be respected if they showed that they were loyal subjects of the British Empire. 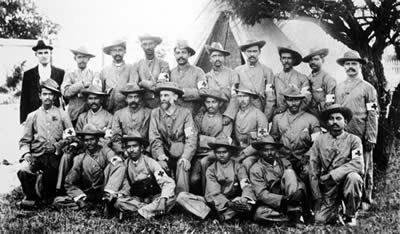 He had led an Indian ambulance corps of about a thousand volunteers for nearly six weeks during the Anglo-Boer War. In 1906, he committed a blunder which proved to be a blessing. During the military operations of the Natal militia against chief Bambata and his followers – who refused to pay a new poll tax – he organised a small stretcher-bearer corps of about 20 Indians. Gandhi did not understand the nature or scope of the rebellion. The corps, which served for a little over a month, was asked to take care of the wounded and whipped Africans since no white would treat them. Seeing the brutality of the whites against the Africans was a traumatic experience for Gandhi. He took a vow of celibacy and wrote to his brother that he had no interest in worldly possessions. Soon after he returned to Johannesburg, the Transvaal government gazetted a humiliating ordinance against the Asiatics. Gandhi recognised that making petitions and deputations to the racist rulers were of no avail unless there was force behind them. He decided to defy the law and mobilised the Indian community to court imprisonment. He discovered non-violent resistance (satyagraha) which was, in essence, pitting the power of the people against guns. By 1914, more than 50,000 Indian workers had gone on strike, 10,000 Indians had been jailed, more than a dozen Indians had been killed and many more tortured or injured. This non-violent resistance forced the racist white government of South Africa to concede the main demands of the struggle. These statements were published in the Gujarati section of Indian Opinion in order to rouse respect towards Africans. Gandhi came to know several educated Africans who were impressed by the organisation and by the struggle of Indians, which was led by him. In 1910, there were discussions on the formation of a national body to defend African rights. Pixley ka Isaka Seme, who initiated the proposal, visited Gandhi at the Tolstoy Farm for consultation. The South African Native National Congress (later renamed the African National Congress) was formed in 1912 and was welcomed by Gandhi. He never sought to impose his leadership over the African people, the sons of the soil, but presented them with the example of satyagraha as a means of deliverance from oppression. Gandhi was moved by the courage and determination of women in the last stage of satyagraha in 1913. The heroism of the working men and women led him to declare in 1914, “These men and women are the salt of India; on them will be built the Indian nation that is to be. ”After returning to India, Gandhi built perhaps the largest mass movement in history of the Indian freedom struggle by uniting people of all classes and encouraging women to participate. He kept up his interest in South Africa and often wrote about the oppression of the Africans. Gandhi’s declaration that India’s freedom must lead to freedom of other oppressed people formed the basis of the foreign policy of India after independence. Under the leadership of Jawaharlal Nehru, India espoused the cause of freedom in the United Nations and the Commonwealth, in sports bodies and other forums. 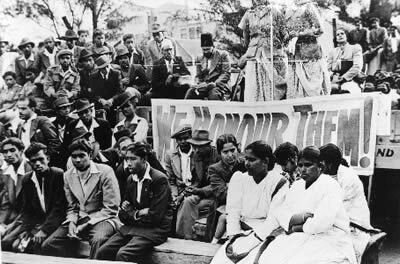 India imposed sanctions against South Africa in 1946 and earned the hostility of the western powers. Leaders of South Africa have often praised Gandhi’s contribution to their liberation from apartheid and for the “miracle” of peaceful transition. “India is Gandhi’s country of birth; South Africa his country of adoption. He was both an Indian and a South African citizen.” (Article in Time, December 31, 1999). In a speech made in New Delhi on October 15, 1990, he referred to Gandhi as the hero of both India and South Africa. Many other African and African American leaders, as well as leaders of other movements for freedom and peace, acknowledged that they derived inspiration from Gandhi. None of them were distracted or disturbed by the statements made by the young Gandhi. Honouring the leaders of the movements for freedom and peace in other countries and publicising their lives is an important contribution towards human solidarity. The United Nations General Assembly unanimously adopted a resolution on January 24, 1979 recommending that leaders of struggles against apartheid, racial discrimination and colonialism, and for peace and international cooperation be honoured by the international community and that their contributions be made widely known for the education of world public opinion, especially of the youth. In New Delhi, the capital of India, there exists an Africa Avenue. There are streets named after Mandela, Gamal Abdel Nasser, Martin Luther King Jr. and Kwame Nkrumah. There are similar streets in other cities. The government of India gave its highest honour, Bharat Ratna, to Mandela and the International Gandhi Peace Prize to Julius Nyerere, Mandela and Desmond Tutu. 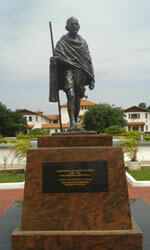 The statue of Gandhi which some students are now opposing was presented to Ghana by the president of India as a token of friendship between the two countries. The recent events at the University of Legon should not be allowed to undermine that friendship. Let it be remembered that J.B. Danquah and Kwame Nkrumah, leaders of the freedom movement in Ghana, both acknowledged the inspiration of Gandhi. It was India which enabled Ghana (then Gold Coast) to attend the Asian African Conference in Bandung in 1955, even before it was independent, while excluding the racist regimes of South Africa and Rhodesia. India and Ghana have been partners in the struggle against apartheid and colonialism at the United Nations and other international fora. Gandhi’s statue in Ghana and Nkrumah’s road in New Delhi should symbolise their continued partnership in protecting human dignity and promoting human welfare.